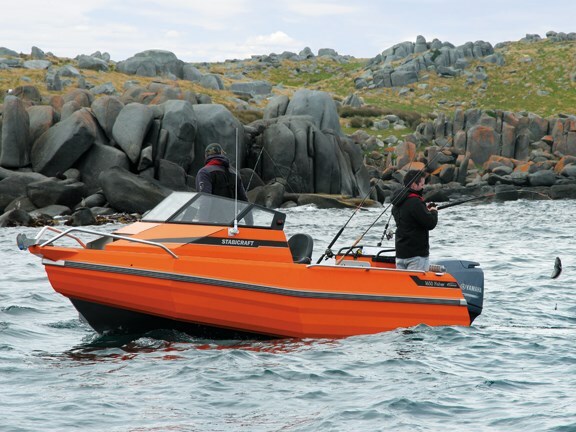 With its bright orange paint job demanding attention, Stabicraft’s all-new 1650 Fisher is very hard to miss. But after taking a trip across Foveaux Strait in pants-changing conditions and coming back smiling, Matthew Jones reckons this no-nonsense boat has plenty of other standout features to excite. Sometimes fancy names for features are just that - fancy names and jargon marketers use to baffle their unsuspecting customers into believing they're actually useful. Not so with Stabicraft, however. Their clever new features with names like Game Chaser Transom and Arrow Pontoon are actually darn useful when it counts. I met Stabicraft's marketing co-ordinator, Tim van Duyl, and sales guru/test boat owner Adam Marshall at dawn on a bleak, rainy morning at Bluff boat ramp. I was dressed in shorts, T-shirt and jandals and covered from head to toe in sun block. It wasn't just the five different weather forecasting websites that were wrong - at least half a dozen locals had told me how beautiful Waitangi Day was meant to be in the deep south… Not so on this occasion. 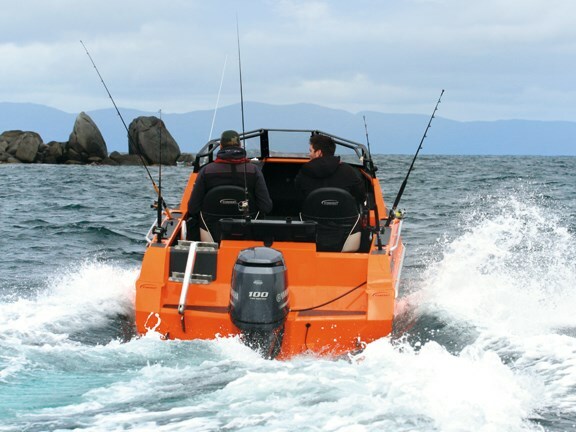 Unfazed by the lacklustre conditions, we launched the Chrysler Orange Stabi and our much larger 9m photo boat and plotted a course to Ruapuke Island, some 14 nautical miles away across the Strait, for the photo shoot. On leaving Bluff, conditions were eerily calm but quickly deteriorated as we left Land's End in our wake. After a stomach-testing 45 minute trip we took what shelter was available at mystical Ruapuke Island to shoot the photos before dropping a few lines and instantly hooking up on blue cod. With a couple in the bin, Marshall kindly handed over the keys and it was time to put the 1650 to the test. Having seen how the Stabicraft lads had driven her I had no reservations about this boat's capability. 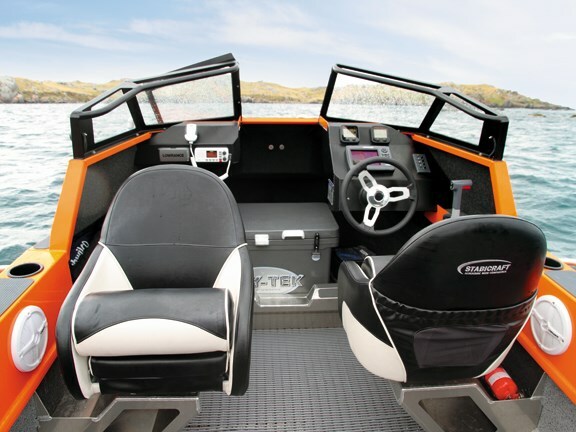 Sitting comfortably at the helm, the sporty steering wheel (now standard on all Fishers 1650 and above) is quite fitting given this boat's sports car-like performance. 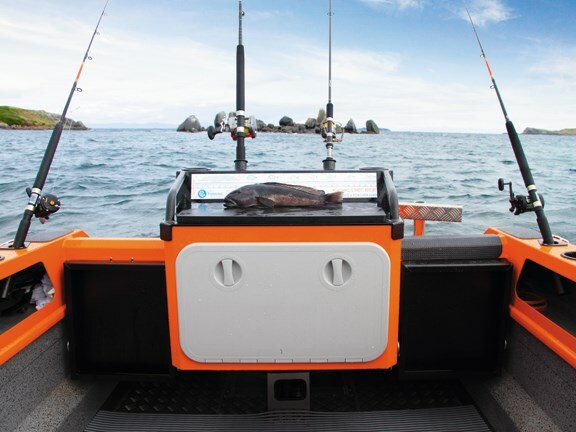 A flush-mounted Lowrance HDS7 fishfinder/chartplotter dominates the dash with room to spare. Throttle and controls fall easily to hand. Visibility is good either seated looking through the windscreen or standing looking over the top. Behind the scenes an Ultra-flex cable system provides smooth, responsive steering. Try as we might, there wasn't enough white-cap-free water during testing to fully unleash the maximum-rated 100hp Yamaha four-stroke to record full performance figures, but Marshall tells me it's capable of 40 knots (75kph). With conditions packing up I had the choice of making the trip back in either the enclosed 9m hardtop photo boat or having some serious fun driving the 5m Stabi through a confused 1-2m swell on the front quarter, with 15-20 knots of wild westerly whipping through. Tough choice, but I chose the Stabi and I'm glad I did. With 100hp bolted on the back there was plenty of power on tap to take control in the rough. Sometimes more than enough, as it was easy to accidentally give it too much and take off. The Game Chaser Transom seemed to like this approach, however. Through the crappiest parts we were averaging 17 knots, and once through the worst it managed 25 knots in full control. Sure there was the occasional bang as we collided with a couple of nasty green ones and, without the optional bimini top and clears fitted, we copped a few spray sandwiches in the face. But there aren't many (if any) 16-footers I'd feel safe using to cross Foveaux Strait in those conditions. Overall, the ride was good and at all times this hull was solid, safe, predictable and rewarding to drive. We arrived back in Bluff, grinning from ear to ear, much to the amazement of the photo boat crew who thought they'd have time to cook a roast before we caught up to them. Back on dry land it was time to take a closer look at the design smarts in play. There have been two fundamental changes to this all-new, all-aluminium Stabicraft, the first of which are the new Arrow Pontoons. Van Duyl explains: "By cutting the pontoon angle back we've basically changed where the shoulder meets the water, which has softened the ride quite dramatically. We've already had great feedback." The second major design improvement is the Game Chaser Transom, which increases the displacement aft and sharpens the stern entry for backing up on trophy winners. 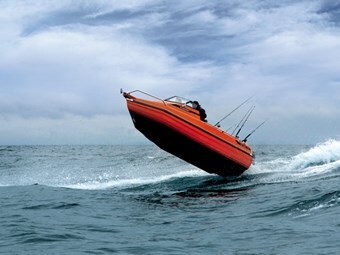 It improves the way the boat rides and aids manoeuvrability in reverse. When you're backing down you can turn the boat on a boat length. When you're chasing bigger fish you're much less prone to the back end of the boat digging in, an aspect of the design Stabicraft is very happy with. The additional aft displacement also boosts stability, caters for heavier four-stroke engines and increases gear-carrying abilities. In fact, the Game Chaser Transom has proved such a success the plan is to standardise it throughout the range within a couple of years. In addition to the older fibreglass bonnet, a lot of thought has gone into the sharp line of the new alloy cabin top. "It's about intersects," says van Duyl. "I don't like to sound like a Mazda car designer, but it's all about forward motion and all the lines follow each other. It has made a big difference to the look and is proving to be a hit with our customers." Stabicraft is constantly striving to innovate and improve by listening to both staff and customer feedback. "It's hard to get excellent stability without sacrificing ride," says van Duyl. "But with the design changes we've made, we think we're getting bloody close to achieving both." One past gripe of mine with Stabicraft Fishers was that only two plastic rod holders were standard, and gear stored in the front 'dump zone' was at risk of getting wet. I'm pleased to report Stabicraft has now gone to four aluminium rod holders, and four drink/tackle holders are included in the standard package. The dump zone in the bow now has a solid bulkhead to prevent any water on the floor running forward and wetting your spare undies - nice. The excellent bait station, with its large filleting-friendly top and well-placed handrails, also adds a further two rod-holders and two drink/sinker holders and comes as standard. The area underneath can either be used for dry, easily accessed storage (as tested). A 66-litre live-bait aquarium can be accommodated under the bait board without sacrificing storage space for batteries and oil tanks. If water sports are on the menu, the bait station simply lifts off and a ski pole fits in but you will have to choose between the tank or the ski pole, as you can't have both. The centre-piece of the scratch-resistant glass screen folds back to allow safe walk-through access to the anchor, and an optional stress-free winch makes anchoring even easier. In the interests of safety, the transom is devoid of doors but the fold-down rear seats with non-skid act as a secure step down into the cockpit. All Stabicraft are built to order. One of the benefits of dealing with a quality-focused and thoroughly professional manufacturer like these guys is the options list allows plenty of choice. With our test boat being Marshall's personal pride and joy it was naturally highly tricked out. Options fitted include: full paint (including stipple coating inside the pontoon frames), a 100-litre, in-floor fuel tank, shiny stainless steel SARCA fairlead, battery compartment hatch, graphics, solid rear boarding ladder, removable ski-pole, comfy Ocean Bolster seats, handy external gunwale handrails, cabin carpet lining and tube floor matting. Sure pontoon boats aren't everyone's ideal boating platform, but after thoroughly 'Foveaux' testing this capable, versatile pocket rocket and taming some very confused and rather rough water, the new Stabicraft 1650 Fisher undoubtedly gets my stamp of approval. The stability and safety of the pontoons in these conditions certainly outweighs any hardening of the ride, and in my opinion the new Arrow Pontoons and Game Chaser Transom have definitely improved this aspect. As an avid fisherman and diver, I'd happily own one. For more information contact your nearest dealer on 0800 4 STABI (0800 478 224) or visit stabicraft.com.